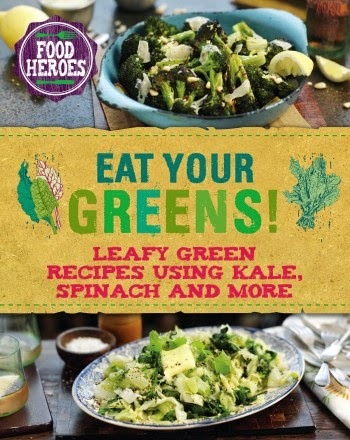 This month's cookbook from Parragon is called Eat Your Greens, and is priced at £6. It was a relief to receive another cookbook full of healthy and wholesome recipes, rather than a book full of sweet treats tempting me to the dark side - I'm trying hard to eat loads of plant-based foods full of goodness, rather than processed foods which have questionable nutritional value, and make me feel, well, rubbish. At the weekend we had a "cheat" ready meal dinner, and boy did I regret it! 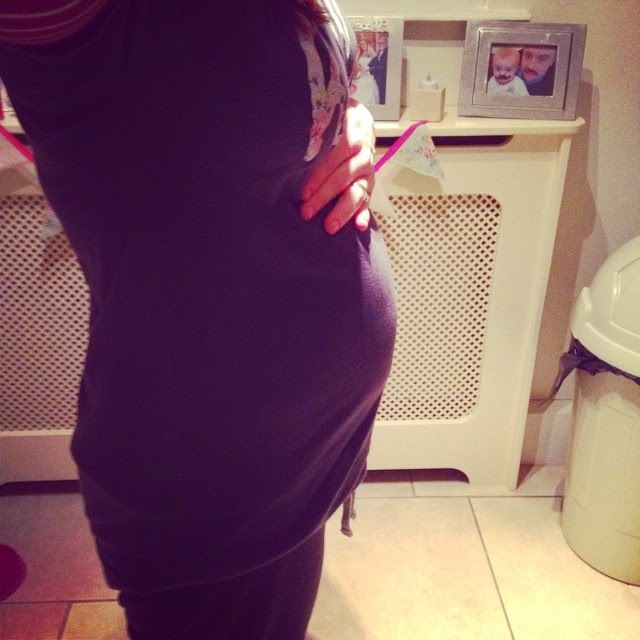 We'd chosen a Ken Hom Chicken Chow Mein meal, which tasted really nice, but after eating it I got the severest case of 'wheat belly' I've ever suffered from - within 15 minutes of eating the food I looked like I was 6 months pregnant! It was horrendous. I was bloated and gassy, my stomach was hard and sore, and it lasted all evening. It just goes to show how much my body has changed, and how it now reacts to a lot of starchy white flour. I still have white flour in my diet in small quantities - the odd slice of white bread, a small portion of white pasta if wholemeal isn't available etc. But my diet is no longer made up of mostly starchy carbs, and I think my body is thanking me for it. So, thankfully, my lovely new shiny cookbook is full to bursting with yummy green recipes using left green veggies such as kale and spinach (two of my favourites). The book explains why greens are so good for us, and which greens are best for cooking, which are best used raw in salads - and how to cook each one to perfection. So, a handy starting point to anybody newly introducing greens to their diets. -Light Bites - 15 mouth watering ideas such as Buckwheat Pancakes with Spinach & Feta, Lentil & Chard soup, and Rocket, White Bean & Tomato Bruschetta. -Mighty Mains - 12 main courses using greens as the star ingredient such as the wonderfully simple Kale, Lemon & Chive Linguine, or the exciting New Potato Pizza with Spinach & Pancetta. -A Bit on the Side - 13 scintillating side dishes from Stir Fried Brussel Sprouts with Almonds, to Spicy Pak Choi with Sesame Sauce - there's a delicious accompaniement idea for every meal. I particularly like the sound of the Steamed Greens with Lemon and Coriander. -Green Juices - 8 fabulous green juice recipes to cure every ache and ailment from a thirst rehydrating Lettuce & Kiwi Quencher, to Rocket, Apple & Ginseng Refresher- if you've never juiced before this book will be a fun starting point for you to have a play with drinking your greens as well as eating. As ever, I wanted to put the book through its paces. So, after having a good read through the recipes I decided to try out two recipes from the 'Light Bites' section for a leisurely weekend brunch. I invited round my lovely in laws, who are equally just as 'foodie', but also health-conscious as we are - I knew they wouldn't miss the fried bacon and the sausages pooling in their own grease - and would appreciate the good quality, healthy ingredients, cooked simply. Both recipes were easy to follow, and used mostly ingredients I already buy in my weekly shop. The potato cakes were made up of unpeeled cooked potatoes, kale, spring onions, dill seeds and lemon rind, as well as a knob of butter and some vegetable oil. 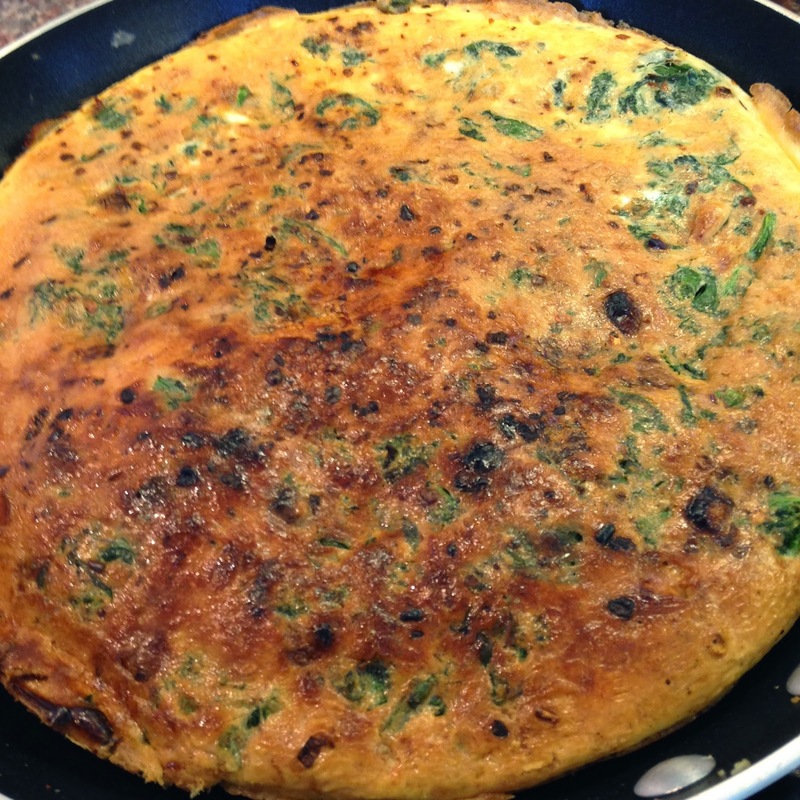 The frittata contained 8 eggs, shallots, garlic, toasted pine nuts, chilli flakes and grated parmesan cheese. Mmmmmm! 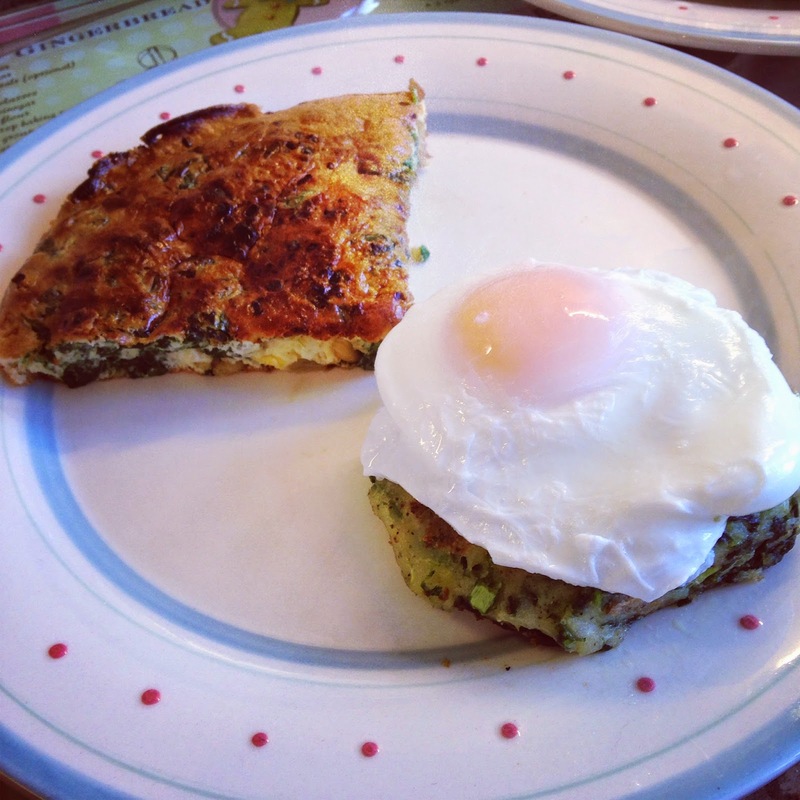 I'm pleased to report both the potato cakes and the frittata were a big hit...there were clean plates all round! The meal worked perfectly for a weekend brunch - but each recipe would be a great addition to any light lunch or dinner too. They are both truly delicious, healthy and versatile recipes. A fabulous way to Eat Your Greens (do you see what I did there?). 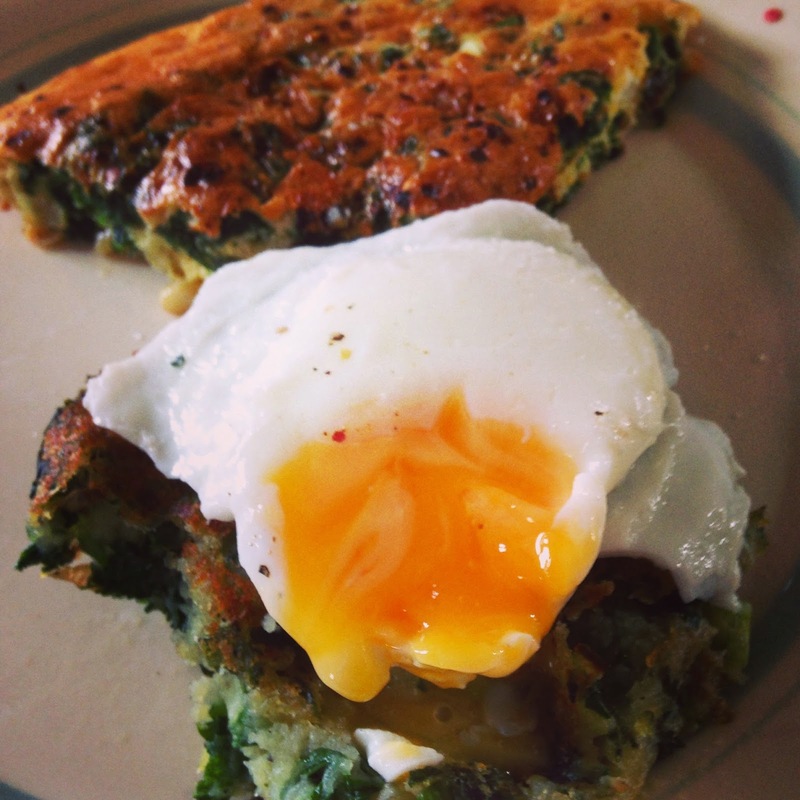 What's your favourite way of cooking eggs? Are you a perfect poacher or just fabulous at fried, do you make sensational scrambled, or are you a boisterous boiler? Poached eggs are my absolute favourite, and I have to say I'm pretty darned good at them now. A dash of vinegar in the water, and a 3 minute timer is the key for me! What have you been cooking up this week? I'd love to know. Disclaimer: I received this product from the publisher for free. However, they have not paid me for this review, and they do not exercise any editorial control over my review or anything else on this site.